I am *THIS CLOSE* to finishing my goals for 2015, but in the meantime, I’ve been rereading my Powersheets and making lists and brainstorming. I’ve never taken this long to set goals in the past, and I’m almost excited about this slower pace, because I’m hoping it means that each goal will have been set with intention, prayer, and hopeful, open-hearted purpose. I’ve also continued building my Make It Happen Board on Pinterest, and this morning, I saw this list on Pinterest from Thyme is Honey and was inspired to make one of my own. The list I created was inspired by many of my Powersheet answers, and each of the items will be a part of my goals for this year. I look forward to pinning this up where I can see it, and being purposeful and intentional about each of these things this year. While there is so much more to each of the items on this list, they are a great starting point for my goals and have brought me some clarity as I finish hashing everything out. P.S. Have you been participating in Lara’s goal-setting process, or reading her Make It Happen book? If so, where are you at in the process? On Saturday, I posted about the first steps in my 2015 goal-setting process. Tonight, I’m going to share the results of the next few steps: the vision I’ve written for my year, as well as what I’m saying YES and NO to in 2015 to support that vision. I’ve loved writing vision statements the last two years, and I’m excited to take this year’s statement to heart and bring it to life. Above all else, I will seek and FIND GOD WHOLEHEARTEDLY this year. I will FOLLOW where He leads, going and doing and creating in line with His heart. I will live fully in each day without worry, fear, or fretting for what may or may not be ahead. I will have hope for all God has planned, but I will also wholeheartedly embrace right where I am TODAY, because I don’t want to miss one moment of what God is doing right here, right now. I will keep an open heart to His way, delighting in any unexpected adventures and possibilities He might bring my way. I will make meaningful memories with friends and family, and I will live in a balance of experiencing the stories and telling them — celebrating all God is doing in my life and in the lives of others. I will make the most of this season, filling my life and heart with all that fires me up and points me to Jesus. I will continue to be a woman who lives an inspired life for God, and I will continue to invite and encourage others to do the same. I really want to live “on purpose” this year, making the most of where God has me and all He’s doing in my life, and I think this vision and these lists will help me do that. I also think they will help me notice and give thanks for the unique ways God has written my story. There have been far too many times I’ve allowed the unexpected parts of my story to cause insecurity and doubt, rather than allowing them to serve as an opportunity to meet and connect with God. I’ll be back in another couple of days to share my goals for the year. I’m not rushing the process, so I’ll let my vision and lists sink in a bit before moving on to actually writing down the goals that are beginning to take shape. Are you following along on Lara’s goal-setting process? If so, how’s the process going for you? Have you hit any roadblocks or discovered anything surprising about yourself or God’s plan for you in working through her steps? Things have been a bit quiet around here lately (no posts in two weeks!). Whoops. But my heart hasn’t been quiet — I’ve been working and praying through some new dreams and ideas. I’ve been feeling super excited about a new venture/idea/dream God has placed on my heart. 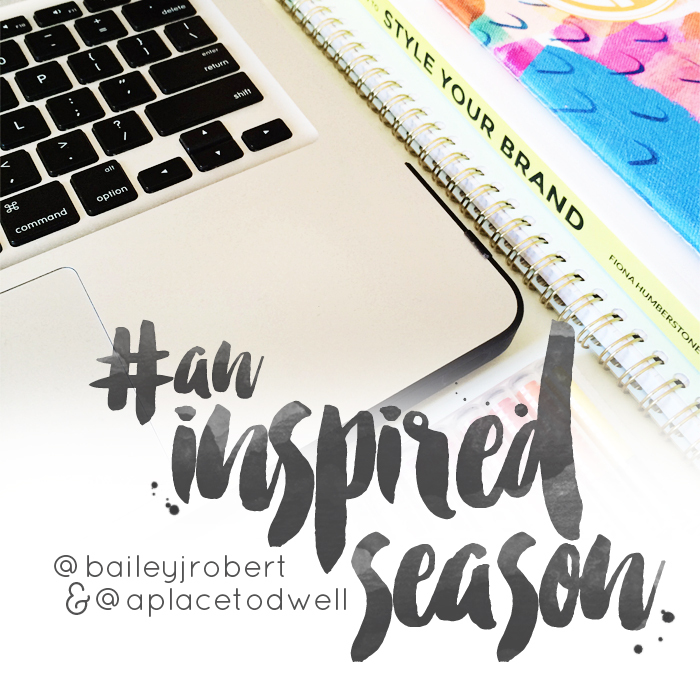 I want to take the whole idea of #AnInspiredLife to the next level. 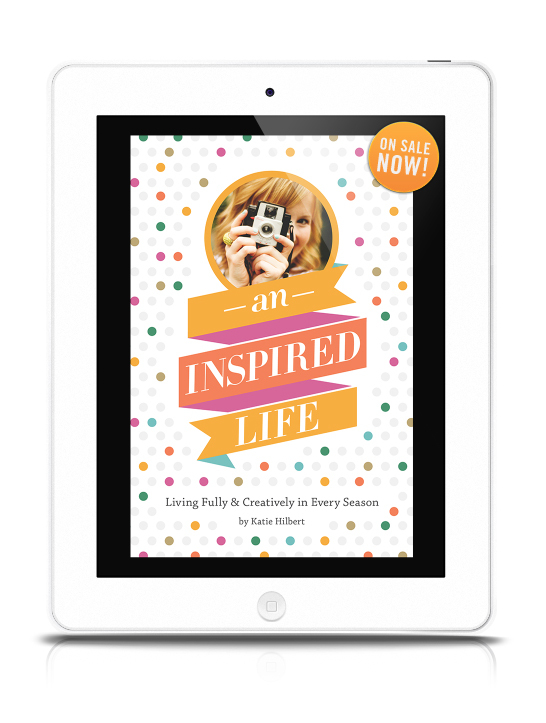 I want to help you live * AND TELL * inspired stories! I’m in the brainstorming, dreaming, praying phase of what this could look like…but thinking about possibly working with people on an individual basis to help them discover the heart of their story and then how to tell and share it creatively. Thinking this could translate to working with you to write your mission statement, web site copy, etc. Over the last few years, I’ve realized how much I love celebrating others’ stories and how inspired I am by what God is doing through each of our stories. I’m also a big geek when it comes to branding and creatively telling our stories, so I’ve realized doing more with the writing side of branding might be a perfect fit for me. Spring is such a good time to explore new hopes and dreams, yes?? More on all of this very soon. A few random, hopeful, springy things: I bought some blueberry coffee (undecided on whether or not I like it); I’ve been filling the house with fresh flowers (makes my heart SO HAPPY); I’ve been reminding myself to be brave (we could all use a reminder sometimes, eh? ); and I’ve been searching for the perfect neon yellow polish.